Interesting model whose name suggests this curly-headed, Shirley-Temple-esque tot may have been modeled on the "Little Orphan Annie" character. 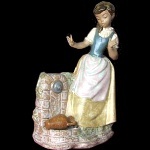 Sculptor: Debón 1988 $75 $100-$125 Little girl in knee-length dress with pink skirt, blue and white bodice with puffy sleeves and ruffled collar. Left foot forward, right hand raised.